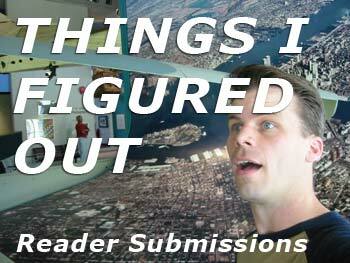 Things I Figured Out: Reader Submissions. alt-right arrow to go forward in internet explorer. I figured out that when someone gets hypothermic (like when you're in cold water), your blood gets redirected to your organs to keep them warm. Your body temperature drops most dramatically when you get OUT of the cold because your blood goes back to your frozen limbs, cools, and returns the cold to your core. That's why it's so important to keep someone warm once you pull them out of the water. Head lice don't prefer 'clean' hair. They like all hair and they just tell you that as a kid so you won't feel as bad for having nits. If you can see the hinges of a door you should pull it, if you can't see them then push it. Works every time! For a long, long time I thought Concentrate (as in juice commercials: Not from Concentrate!) was a place. I realized somewhere around 5th grade what was really going on there. Alt, space, x = maximize window. Alt, space, c = close window. Note that these are pressed and then released, not pressed concurrently. You can get pretty fast with these. There is no such word as "alot". When someone has had a large amount of fun, the correct way to relate this is "I had a lot of fun" and not "I had alot of fun." Got a slow computer? An alternative to upgrading is to simply goto System Properties and turn off System Restore. It's utterly useless, harbors viruses, and never works as intended.Rather, in System Properties find the Performance Settings and increase your Virtual Memory by the amount of data you cleared from System Restore. You can literally use a few hundred MegaBytes (MB) to act as more RAM. When looking at a map of the US Interstate Highways, if they end in 0, (I-10, I-40, etc.) they run East to West (horizontal). If they end in a 5 (I-5, I-35) they run North to South (vertical). A while back when I was a wee lad I realized that the term "computer" is a massive blanket term. It means anything capable of processing data. Digital watches, calculators,that sort of thing, are all computers. MP3 players are computers pourpose built for playing auido, and they're about as complex as desktop computers were 15 or 20 years ago. They even have hard drives and an operating system. It's strange, then, to hear someone say "I hate computers!" while wearing a digital watch. Free Throws are actually not free, you earned them. When making coffee with cream and sugar, put the cream and sugar in the cup. Then pour in the coffee. You will never have to stir! That even though the menu shows the #4 at Dunkin' Donuts with sausage � the breakfast sandwich on a croissant with a coffee - you can actually get it with ham or bacon, all you have to do is ask. Nice! Another logo one - Pennzoil's logo is the cracked Liberty Bell. Pennzoil...Pennsylvania. Only noticed that this year (I'm 29). I was in HS before i stopped wondering where this "Orientar" place was, and why it has THREE kings. Hooked-On-Phonics means someone is HOOKED ON PHONICS! I never put it together, just thought it was that name. If you are going to play in the snow, put the ends of your gloves over your jacket, so snow doesn't get in. Many people think that the Ivy League colleges are named so because of ivy-covered walls. Not true. When the different colleges got together for football, they were the Fourth League. The Roman numeral for four is IV. Say the roman numeral out loud and there you have it! Libraries charge overdue fines in order to persuade you to return your books on time. It is not to make money. The money made from fines is small and not worth the trouble we put into it. Libraries need people to return their books quickly so they don't need to have dozens of copies of each book. The expression is "dog-eat-dog world," not "doggie-dog world." Also, "for all intents and purposes," not "for all intensive purposes." If you want to remove candle wax from a candle holder just stick it in the freezer for a little bit, then simply pry it out with a knife. When hand washing dishes, do greasy dishes last becuase they ruin the water. Also, don't drop knives in the water until you are ready to wash them becuase you can't see where the blade is pointing under soapy water. The word "ultimate" is incorrectly used by advertisers (and a lot of people) to mean "best," when it literally means "final." I realized this when I learned the word "penultimate" which means second-to-last. So, the "ultimate burger" is really the final burger, not the "best" burger. Augusta's not the capital of Georgia, it's the capital of Maine. I was looking at a map while driving through Augusta, GA, on the way to Atlanta, when I figured this one out. I'd never lived in a capital city before. When a plant grows towards a light, the bending process is actually one side of the plant growing faster than the other. energy, the body is only able to harness 40% of the energy that arises when the molecules bonds are broken, the rest is lost to heat. In comparison, a car only uses 25% of gasoline's potential energy. "No outlet" signs do not mean that the houses on the street have no outlets, and therefore no electricity. Mom likes to bring that one up at parties.